Effective Learning in the Life Sciences is intended to help ensure that each student achieves his or her true potential by learning how to solve problems creatively in laboratory, field or other workplace setting. Each chapter describes state of the art approaches to learning and teaching and will include case studies, worked examples and a section that lists additional online and other resources. All of the chapters are written from the perspective both of students and academics and emphasize and embrace effective scientific method throughout. This title also draws on experience from a major project conducted by the Centre for Bioscience, with a wide range of collaborators, designed to identify and implement creative teaching in bioscience laboratories and field settings. 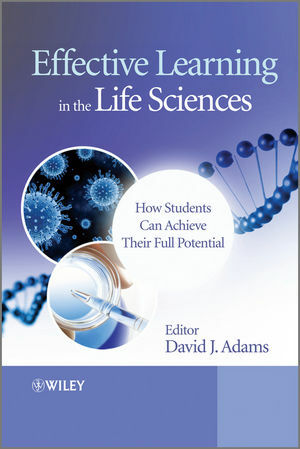 With a strong emphasis on students thinking for themselves and actively learning about their chosen subject Effective Learning in the Life Sciences provides an invaluable guide to making the university experience as effective as possible. David Adams is Ian Mactaggart Professor of Property and Urban Studies, University of Glasgow. Chapter 1: Creativity (David J. Adams & Kevin Byron). Chapter 2: Problem solving: developing critical, evaluative and analytical thinking skills (Tina L. Overton). Chapter 3: In the Laboratory )Pauline Millican & David J. Adams). Chapter 4: Fieldwork (Julie Peacock, Julian R. Park & Alice Mauchline). Chapter 5: In vivo work (Dave Lewis). Chapter 6: Research projects (Martin Luck). Chapter 7: Maths and Stats for Biologists (Dawn Hawkins). Chapter 8: E-learning for biologists (Jo Badge, Jon Scott, Terry McAndrew). Chapter 9: Bioethics (Chris Willmott). Chapter 10: Assessment, Feedback and Review (Stephen Maw & Paul Orsmond). Chapter 11: Communication in the Biosciences (Maureen Dawson & Joanna Verran). Chapter 12: Bioenterprise (Lee J. Beniston, David J. Adams & Carol Wakeford).